NachtHerr - This is another rushed BH5 at 2369 trophies. It was started on the first day of the update as well. I've experimented with a variety of bases on this game and most recently put up one of Jaso's designs. This one seems to be doing ok, so I'll probably cruise it up to 3000 trophies. It relies on pathing and a well defended core to bust up the ground attack. KussVonNacht - The last of my three BH5 games, this one is at 2184 trophies. I've been changing the design of this base multiple times each day. This latest one is another original and has done ok thus far; it's lasted two days, which is saying something. 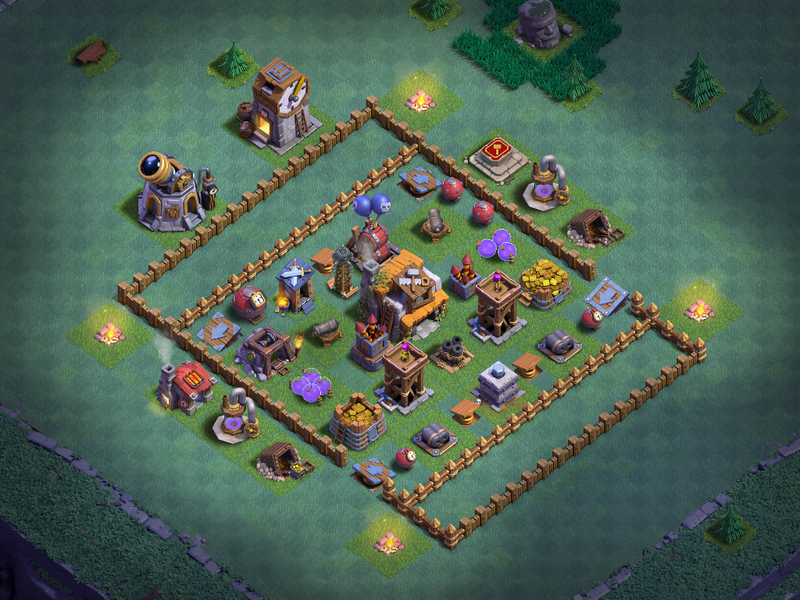 ClashManiac - A rushed BH4 that is currently at 1238 trophies, this game was started a couple of weeks after the update was released and only recently made the move to BH4. 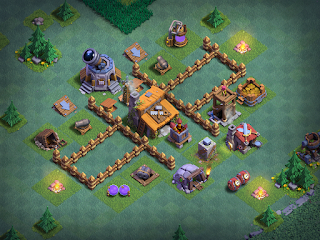 All defenses are down and this is another one where the base design changes daily, often multiple times. This current design was tested earlier today and did ok; we'll see if it doesn't end up being swapped out in the next day or two as well. I used elements of multiple bases in the design of this one, including both originals and Internet bases. Psyberon - This BH4 game was started a day or two after the update released and is relatively on par with the others started at the same time. The one key difference - I'm maxing this game along the way. 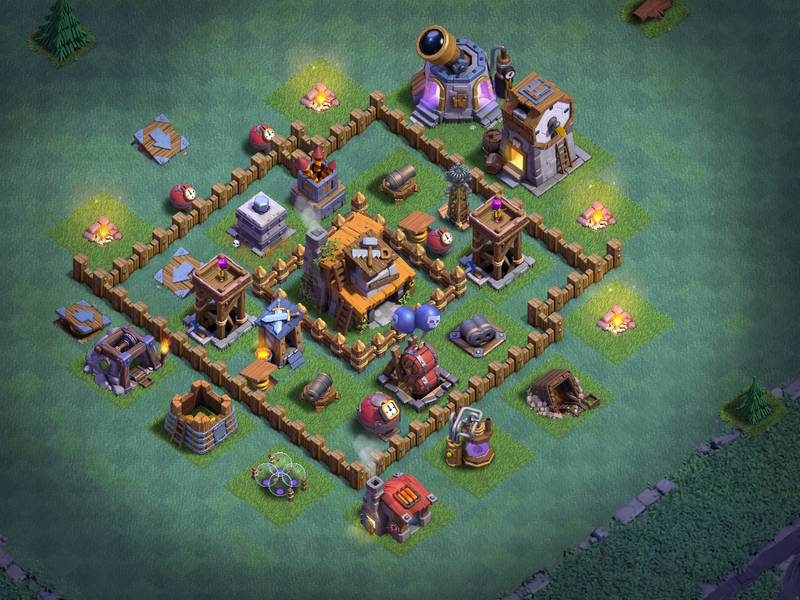 I made the jump from BH3 to BH4 before the walls and a couple of troops were done, so I had that to clean up when the upgrade finished. Right now, everything on the ground is maxed other than the Gem Mine and walls. I'm not finding a really good, knock-out, base design for BH4. I'm keeping this game between 1600-1800 trophies at the moment (it's currently at 1663). The latest base design is a donut and I'm getting mixed results. ZedVerteidgung - A recently launched, BH3 game hanging in at 1052 trophies. As of yesterday, everything has been maxed except the walls. 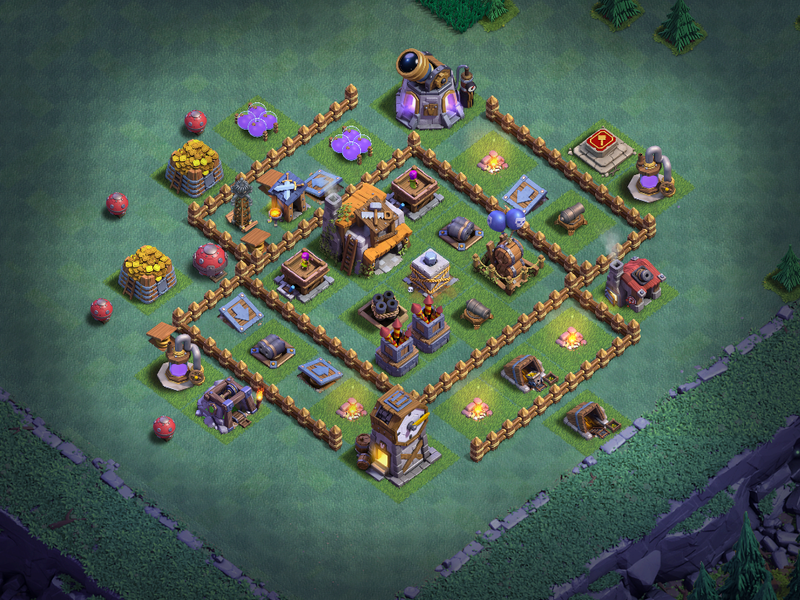 My raids ended yesterday with 168K in gold and full Elixir Storages. I'll run one raid today, then pull the trigger on the BH4 upgrade. 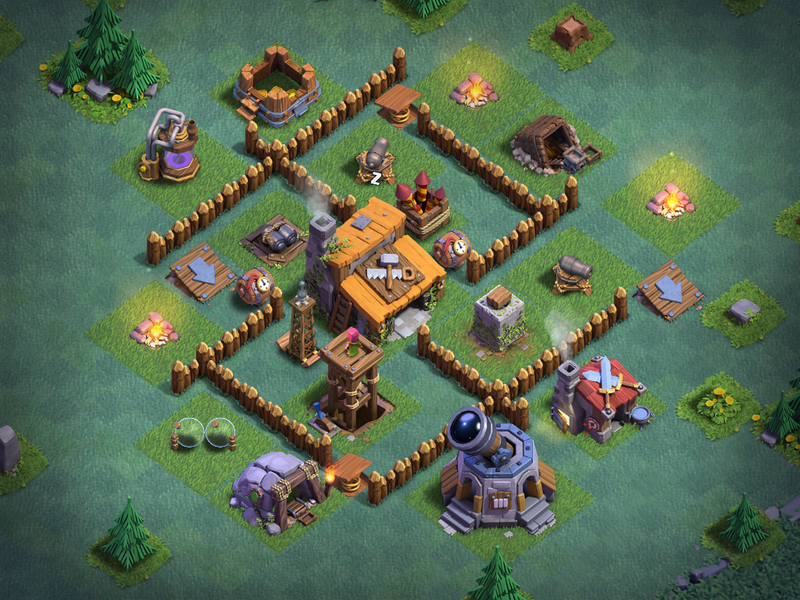 The plan is to drop the second Elixir Storage as soon as BH4 is built, upgrade it, then drop the fourth Army Camp. As I've mentioned before - the Army Camps are without a doubt the very first thing needed on each level, especially with some of the goofiness we see on the matchmaker. 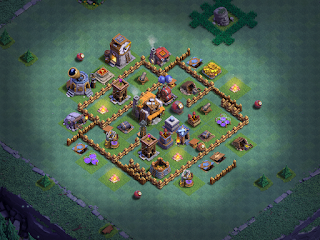 This base was originally designed just for fun; then it actually worked out pretty good so I kept it a few days. NaidCosanta - Last, but not least, is the youngest of the 7 games I'm playing right now. I started this one less than a week ago and it's only up to 623 trophies. I just dropped the Crusher last night and repaired the Gem Mine today. 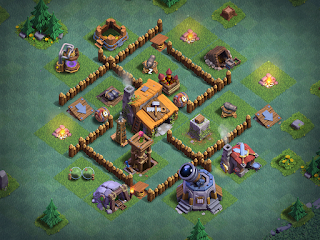 I've been looking at pathing based designs for BH3 (like the one above) and came across this one in a Google pic search. It's tied to an article on XYZArena and looked pretty neat, so I decided to give it a try. 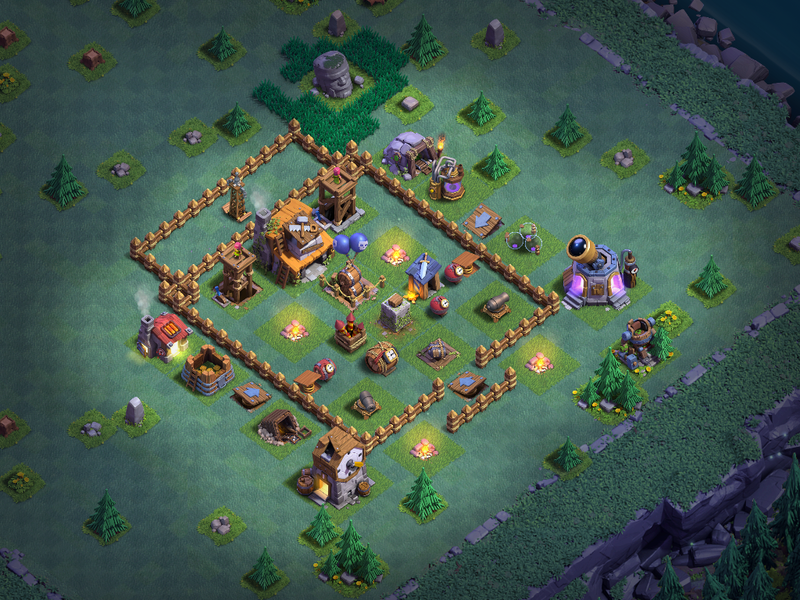 Most attacks on BH3 are a combination of Giants and Sneaky Archers; if you can separate the two quickly enough, the defenses will take them out, often before even a single star is earned. This works at BH4 early on as well, but it doesn't last very long. 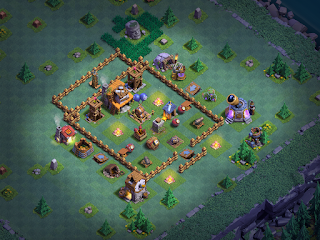 Open bases with pathing designed to confuse the AI and separate tanks from more exposed troops is definitely the way to go at BH3. 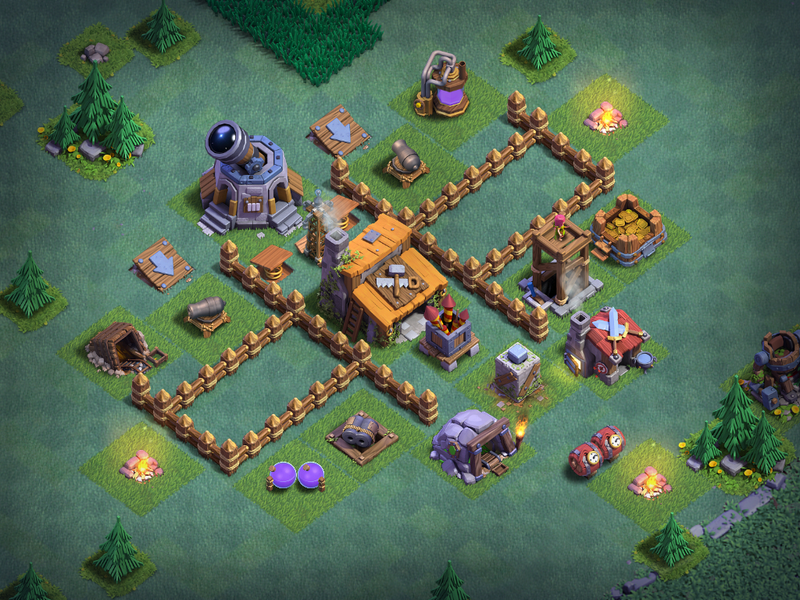 So there ya go - the latest set of Builder's Base designs I am running on the 7 CoC games getting my attention. Hope you find it useful!